Congratulations! You're ready to strike out on your own and move into your first apartment. While renting is more attainable than owning, there are still significant financial considerations that go into your decision. Don't let unforeseen obstacles derail your plans. 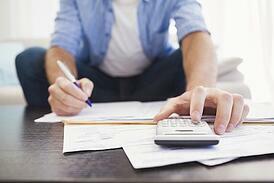 Learn from those who have gone before with these valuable budgeting tips. Not all expenses are applicable in every community, so make sure you are clear about what you will be expected to pay. Of course, you certainly know that you need to have at least some basic furniture to get started. What many people forget are the mundane but necessary items such as shower curtains, can openers, waste baskets and cleaning supplies. Make a list of essentials and include them in your up-front expenses. You don't want to prepare for bedtime on your first night and suddenly discover you're stuck without toilet paper. While the concept usually applies to writing, financial experts recommend the same idea for creating your budget. Divide your monthly income by three, with one-third going toward rent, one-third covering expenses (including taxes, utilities, car payment and groceries), and the final third for discretionary spending such as entertainment, travel and savings. Don't be overambitious and refuse to allow yourself some "fun money." You should certainly invest discretionary dollars in a rainy day fund and other forms of savings. But if you allow yourself no wiggle room, you are likely to start feeling deprived, which sets the stage for a budget-crushing splurge. This might seem like a no-brainer, but people underestimate the importance of timely rent payment until it's too late. Housing is your biggest expense and a poor payment record can cause serious damage to your credit rating. Make rent the first item on your monthly budget and work from there. Choosing a luxury apartment home in one of our Springs communities can actually save you money. With on-site amenities such as 24-hour fitness centers and resort-style pools, as well as social events put on by our management team, you'll find a variety of activities with something for everyone. Do you have a funny story about moving out on your own? Share it with us in the comments!